In case you haven’t heard, tonight there will be another big public meeting regarding the future of planned “road diet” bike lanes for North Figueroa Street. The meeting takes place tonight at 6:00 p.m.* at Franklin High School, more information at this Facebook event. Supporters of safe streets and bicycle lane supporters are encouraged to arrive early and to wear green. 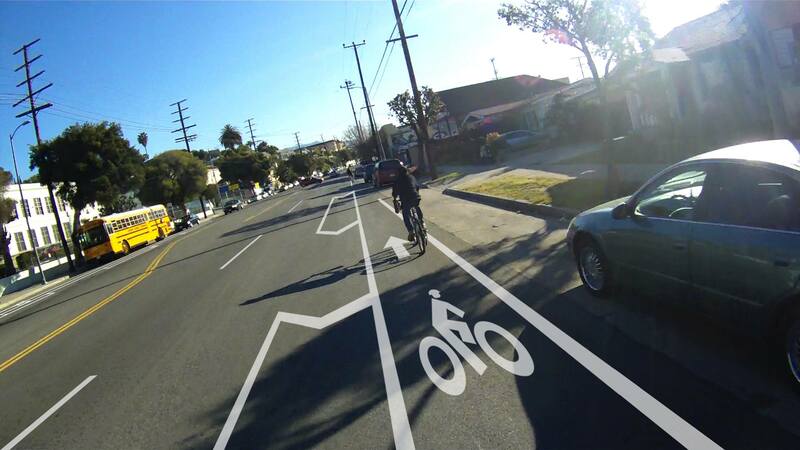 The host of the meeting is Los Angeles City Councilmember Gil Cedillo, who expressed support for the bike lanes during the election, but, since, has promoted an alternative circuitous sharrow-ed bike route instead. Cedillo hosted this earlier meeting, where public safety representatives testified against the bike lanes, which would improve public safety. Then it turned out that the officials didn’t have any documentation to back their assertions. Cedillo has been going all out to rally opposition to the bike lanes. Northeast Los Angeles residents have been receiving “robo-calls” recorded by Gil Cedillo. Cedillo staff have organized anti-bike lane petition signature-gathering door-to-door targeting North Figueroa area businesses. Activists, including Flying Pigeon and the L.A. County Bicycle Coalition, have countered these efforts by door-to-door business signature gathering in favor of the bike lanes. Road diet supporters have printed sashes, organized feeder rides, reached out to media, and are primed to pack the meeting. What’s up with all this? Why is Cedillo so opposed to this road diet? Cedillo has a long history of supporting respect for immigrants and for working class persons and families. In siding with the existing car-centric status quo on North Figueroa, Cedillo is siding with primarily outsider, middle-to-upper-class drivers against the young, the elderly, the mostly-Latino families who live along and walk along North Figueroa Street. If this theory is true, this is a bit like Cedillo shooting himself in the foot because his campaign opponent complimented the foot. I hope Cedillo can see past electoral divisions, and understand that reducing car lanes will make North Figueroa safer for everyone. This public safety serves the very constituents that Cedillo has championed in the past: the immigrants, families, youth, elderly, and small businesses of Northeast Los Angeles. Nonetheless, it looks like an uphill struggle, with Cedillo’s mind already made up. If you support livability, bikeability, walkability, public safety, please attend tonight’s meeting. Thanks for persisting – meeting is at 6pm! We’ll see everyone there! It’s a cruddy name. Road Diet sounds like a thing people do to reduce driving. It should be called Lane Diet.